Prototype: German Federal Railroad (DB) class 290 heavy switch engine. Era IV version in the old crimson color scheme. Former class V 90. B-B wheel arrangement. Use: Switching work, hump yard work, freight service on short routes. Model: Era IV. The locomotive frame and the main part of the body are die-cast metal. The locomotive has Telex couplers and a DCC/Selectrix decoder. It has a powerful motor with a bell-shaped armature and a flywheel, centrally mounted. 4 axles powered through cardan shafts. Traction tires. The lighting is done with maintenance-free LEDs. The headlights and marker lights will work in conventional operation and can be controlled digitally. There is a representation of the engineer's cab interior. 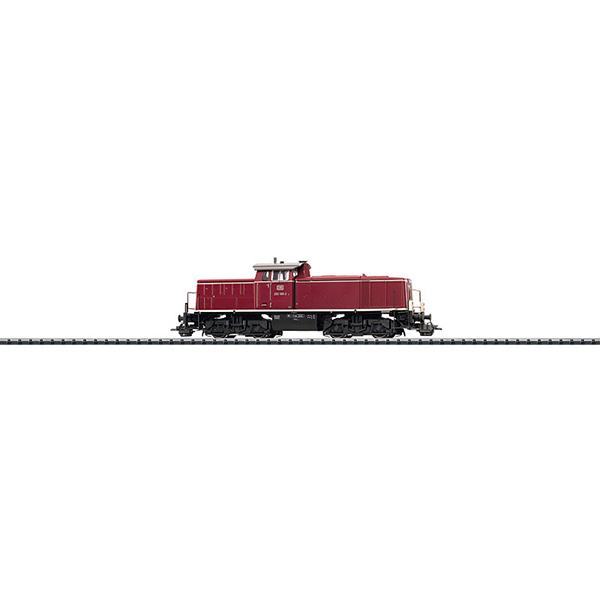 The locomotive has separately applied metal grab irons. Additional steps are included. The locomotive has NEM coupler pockets. Length over the buffers 164 mm / 6-7/16.